Stratolaunch, the world’s largest aircraft by wingspan, takes off from Mojave Air & Space Port on April 13, 2019. Stratolaunch is 500,000 pounds, much of which is due to its twin fuselage-design and six 747 jet engines, and it boasts an unprecedented 385-foot wingspan (beating out even Howard Hughes’ Spruce Goose). It attained a maximum flight speed of 189 miles per hour during its morning flight on Saturday, which saw it taking off from California’s Mojave Air and Space Port. Stratolaunch, the world’s largest aircraft by wingspan, flying near Mojave Air & Space Port on April 13, 2019. The Northrop Grumman subsidiary Scaled Composites built the plane, which was was first announced in 2011 and remained on the ground far beyond its originally planned first test flight date in 2016. According to CNN, the cost of the project remains unknown, but it is made out of carbon fiber material instead of aluminum, and it reduced costs by using components originally designed for the 747, like the Pratt & Whitney engines and its 28 wheels. One might wonder the need for such an aircraft; only a handful of twin-fuselage planes have been developed in the past few decades. It’s spaceflight. The craft is designed to fly as many as three rockets to approximately 35,000 feet in the air, where they can be air-launched at a lower cost and with less overhead than a traditional launchpad. This method also saves on fuel and minimizes complications from bad weather, as the plane can simply fly over storm systems. 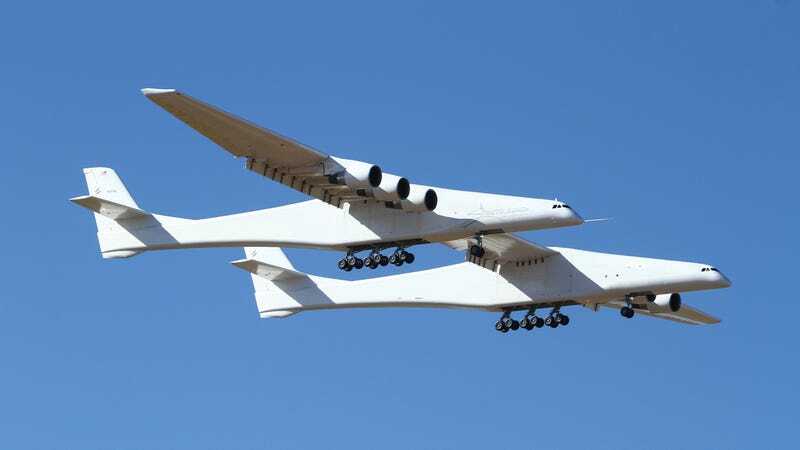 While Northrop Grumman is already planning on using the Stratolaunch to launch Pegasus XL rockets, other private companies, NASA, and the military have all expressed interest in the project.